Creating your own paper goods for your wedding can be great way to cut costs, but where do you start if you want to go more of the handmade route and don’t own a letterpress printing machine or a gocco? Well, leave it to Laurie Cinotto to show us how to create an adorable set of “Save the Dates” without breaking the bank. I love the concept of “printing by hand” and like so many of Laurie’s other projects the possibilites are endless. Invitations, napkins, coasters, table runners – you name it and it can be done. Enjoy! Acrylic blocks are available in any craft store carrying stamping products. Sticky foam sheets are found in the kids craft section in craft stores. 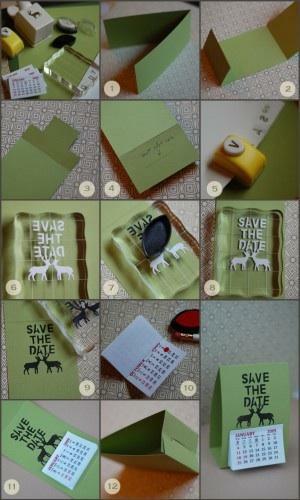 Small paper calendars are found in office supply or scrap booking stores. 1. Begin by measuring and cutting a strip of card stock 3 inches wide and 12 inches long. 4, On one end, use your scissors or X-Acto knife to a one inch square from each corner. This will leave a tab, one inch wide, on the end of your paper. 6. Set aside while you prepare your stamp. 8. Use your craft punches to punch out any images you would like to add to your stamp. 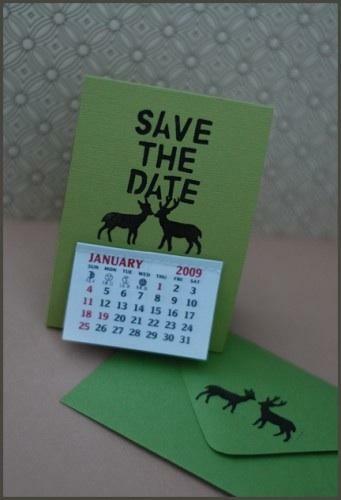 I chose two deer craft punches for my stamp, but you can use any image or motif to coordinate with your wedding theme. You can also draw any image onto your foam and cut it out with an X-Acto knife or small pair of scissors to create something unique. 12. Set aside the stamped card stock and allow to dry. 15. Insert the tab into the slit to complete your desk calender. (see figure 12) Fold it flat to fit in an envelope along with any other information or details you would like to send to your guests. You can create these custom stamps to decorate invitations, envelopes, place cards or any other paper products. You can use fabric inks instead of pigment inks to stamp on fabric napkins, table cloths or table runners. The possibilities are endless. Even though you are working with inks for rubber stamps, when they are printed using the foam stamps, they have a quality similar to a silk screened image. When you are through with your project, you can remove your letters and images, clean with alcohol, and use again.